. إن الخدمات التي يقدمها ميدينا سيرفيسد أبارتمينتس مارتن بليس تضمن للنزلاء إقامة مريحة. هذه بعض الخدمات الموجودة في هذا الفندق: واي فاي مجاني في جميع الغرف, مكتب الاستقبال على مدار الساعة, مرافق مخصصة لذوي الاحتياجات الخاصة, تسجيل وصول/خروج سريع, تخزين الأمتعة. تعكس غرف الفندق البالغ عددها 49 المنتشرة في 7 طوابق جواً من الدفء والألفة.خدمات عصرية مثل تلفزيون بشاشة مسطحة, غرف لغير المدخنين, مكيف هواء, مكتب, ميني بار موجودة في بعض الغرف المختارة. يمكنك الاستمتاع بالأجواء المريحة التي تقدمها مركز للياقة البدنية, تدليك طوال النهار. إن ميدينا سيرفيسد أبارتمينتس مارتن بليس هو خيارك لخدمة الفنادق الراقية في سيدني. Very good and central location, just off Martin Place, in a quiet dead end street. The aparthotel was build in 1998 and certain things have not been updated, like the shower which is difficult to get in and out. Most annoying was the fact that mixing cold and hot water was just impossible, especially in the bathroom sink. + very low water pressure. Wifi is very slow, unless you are prepared to pay for it. Lighting in the bathroom was terrible. Everything else was OK. Nog great, just OK.
Clean and comfortable, full size kitchen, washing machine, dryer, tv, wifi, balcony. 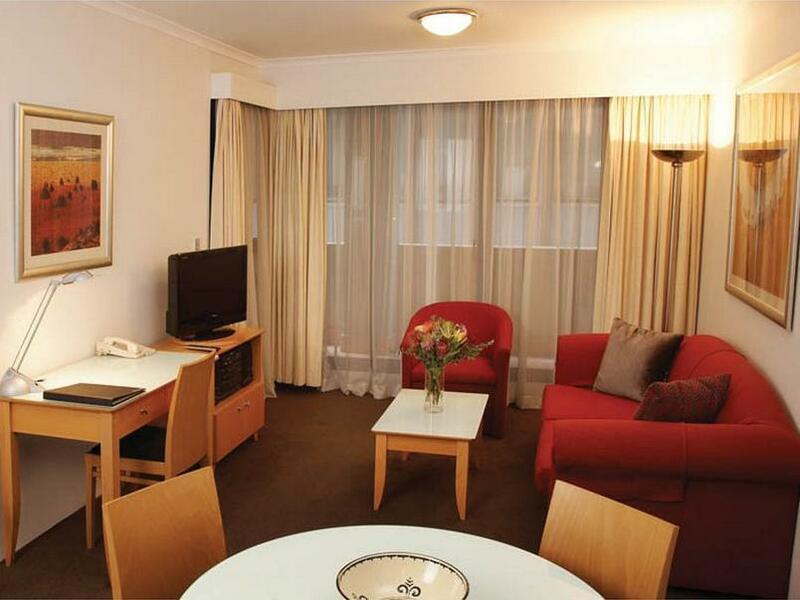 Very convenient to Martin Place, trains, a short walk to Circular Quay, an easy walk to the Domain/museum districts. 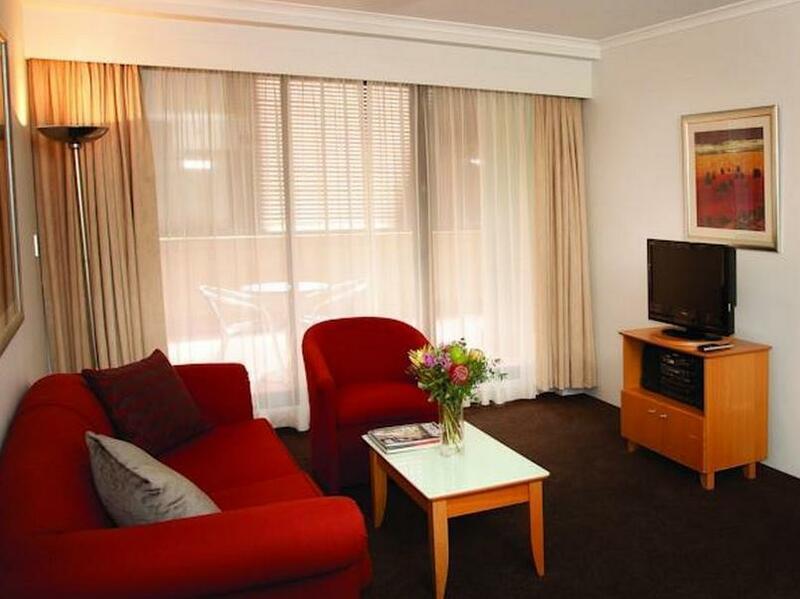 Enjoyed a comfortable night stay in a spacious one bedroom premier apartment. Staff provided linen for sofa bed and extra towels and milk for tea on request. Late checkout was appreciated, as we checked in late after flight. IGA 150metres away in Martin Place. Easy 10 minute walk to Circular Quay to meet our cruise ship. Highly recommend the central location. Walking distance to most scenic places in CBD, restaurants in The Rocks, Circular Quay, Opera House, etc. Will consider to stay here again in coming trips to Sydney. Staff insisted extra person had to pay even though no extra bed was needed and no breakfast provided. Said it was a policy. Room was spacious, kitchen and washing machine useful for people who stay long. Within CBD area, near metro station. Used the apartments for a quick trip to Sydney. Arrived at night and the nearby supermarkets and apartment cooking facilities were very useful. Good quality tea/coffee supplies refilled during the quick room service. 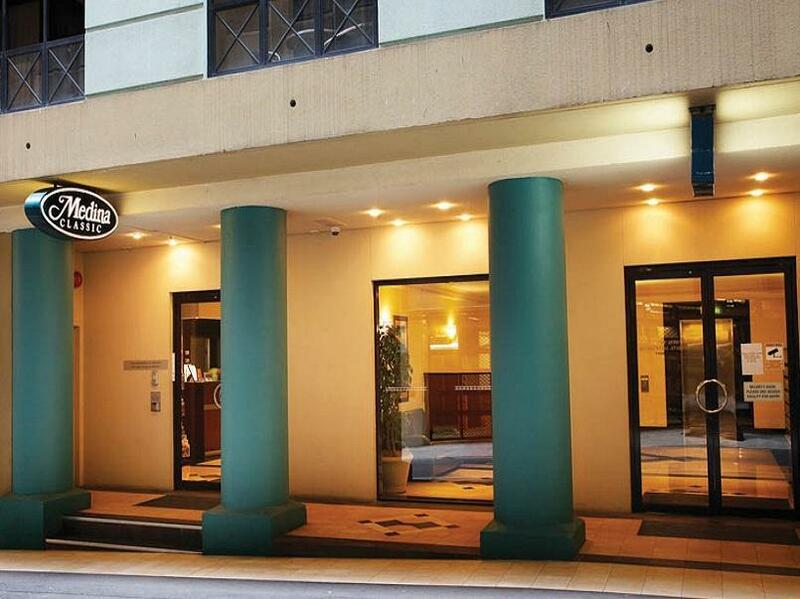 It was a very pleasant stay at the hotel with excellent service and the location of the hotel is right at the Sydney CBD which makes it easy for business or tourist travel. Hope to stay there in future visits to Sydney. after entering the room i wished we'd been able to arrive sooner. great 1 bed apartment, great size with a massive balcony. downside is the overpriced parking of $51.50 (which is supposedly 1/2 price of general price), however I know of other parking within the city and walkable distance which is only $30 retail price (Wilson brand instead of Secure parking). Great stay though, and extremely practical location. I'd definitely recommend staying here to anyone needing a reasonable priced apartment in the centre of town. the location was fantastic- we were close to everything. It was a great home base- comfy, well equipped, a great homey environment. The staff were lovely- accommodating and friendly. We have an active 1 1/2 year old, and we couldn't have chosen a better place to stay. There was enough room for him to play, the shower had a little bath which was great, and a well equipped kitchen made it so easy to look after him. The staff were very helpful and friendly, and the apartments are well located, making travelling and sight-seeing around the city easy. Our stay at the Medina Serviced Apartments was fantastic. Great sized apartment, with huge balcony and king bed. Certainly felt like you were staying at home. Staff were very helpful, and friendly. Organised a taxi to pick us up and take us to the airport at 5am. Also allowed early check in and called when the apartment had been cleaned, as I arrived in Sydney at 7am. Location is fantastic, we walked everywhere. Would certainly stay here again and recommend. I scored food 1 because there is no restaurant and I didn't order room service, so I can not rate. I had good stay. It was down a side street but good cause no noise. Room warm. Bed bit hard but plenty of room. Kitchen etc. best was could walk to every thing. Bit expensive but so is all if sydney city. But compared to alot was big room fir the price. The only disruption to our sleep were the bin removalists on the street after midnight on Monday. So opt for a room not at the very end. On a positive note though, staff were very friendly especially when we couldn't find the location, they came out to find us. It was very underwhelming for a Medina. My past stays at a Medina hotel have been good and the rooms have been good quality. This was a cheap and nasty version. The room size was good and there was a large balcony with the room. Due to the location and being surrounded by larger buildings and being down an ally way, there was no natural light that entered the room. This made the lights important and only one light was any brighter than dull. The bedroom was the worst part of the room. My "queen bed" was two tiny single beds pushed together. On top of that, the pillows were the exact definition of old and lumpy. I struggle to sleep well due to my legs hanging significantly over the end of the bed and my head never being comfortable. It was real poor 2 star quality bedding. The lounge and kitchen were in an open space setup. The kitchen was fresh and clean, and the best part of the room, but I wasn't there to use the kitchen. The lounge suit was average. Old, dirty and uncomfortable. The television was small and sound quality was poor. Selected Foxtel channels would be expected at the price charged too. The bathroom was crap. The shower, as expected, required a step of 1m high to get into the shower. The shower was starting to become mouldy and the size was tiny. The shower head didn't even come up to my shoulders either with 1.5m of space between the shower head and roof to put it in to make it possible to wash hair and face. The water was odd. If I had the hot and cold taps on at the same time, only the hot water worked so it was extremely hot. Overall the room needs an upgrade and professional clean to make it more modern, more fresh and more worth the money charged because it's only worth $140 per night at its current state. very good stay except for the night working outside. There was major roadworks with very loud machinery from a gas company.Given that it was a side road, it made no sense for the works to begin at 5 pm until 5 am.It spoiled an otherwise pleasant stay. Staff, cleanliness and having a spacious apartment. The apartment was a hidden treasure. Quiet (due to double glazing)and the spaciousness was unreal for a city apartment. The only downside was not having a window to look out of but to me that wasn't a problem as there was no traffic noise and the convenient location was great. Excellent from start to finish and very good value too.Note travellers, you don't stay here for the view,because there isn't one. 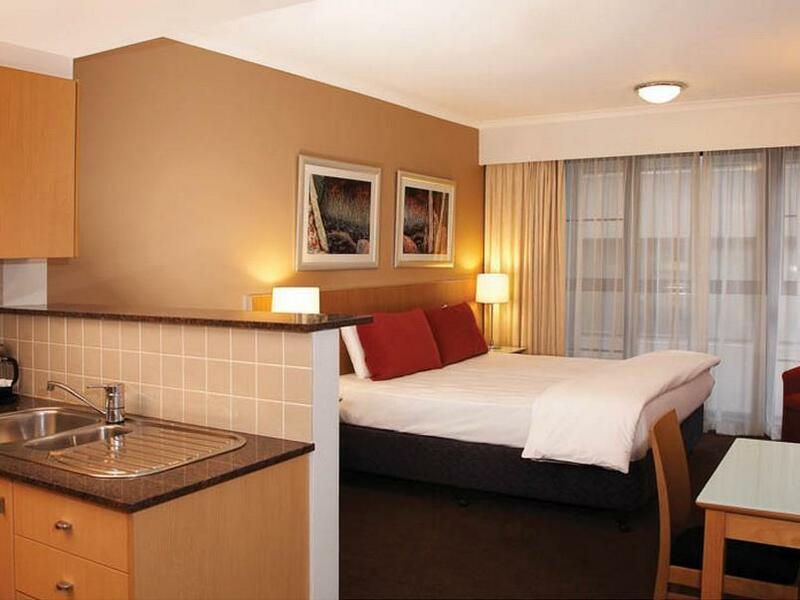 But the best of Sydney is right on your doorstep, and when you are all tired out, its a really comfortable nest to bed down in for way less than Hotel price. Very very well equipped and super clean..
Stay was very good. The staff were all very friendly and efficient and welcomed us each time we entered the reception area.. WE had a one bedroom apartment, on the 5th floor, which was quite spacious and comfortable. The rooms are slightly dated and I would suggest they could do with a refurbishment. The bath/shower area was difficult to get into and someone less agile may have difficulty getting in and out of shower. Although the apartment was generally clean the carpet could have done with a clean The Wi-Fi reception was not good in our apartment. I could recommend.